Qashqadaryo Region (Uzbek: Qashqadaryo viloyati, Қашқадарё вилояти, قەشقەدەريا ۋىلايەتى; old spelling Kashkadarya Region) is one of the regions of Uzbekistan, located in the south-eastern part of the country in the basin of the Qashqadaryo River and on the western slopes of the Pamir-Alay mountains. 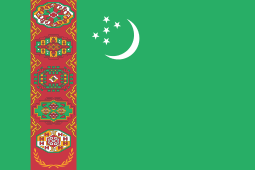 It borders with Tajikistan, Turkmenistan, Samarqand Region, Bukhara Region and Surxondaryo Region. It covers an area of 28,400 km². 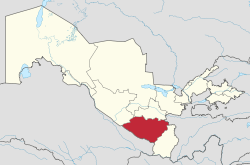 The population is estimated to be around 2,067,000 (2007), with some 73% living in rural areas. The regional capital is Karshi (Qarshi) (pop est 177,000 inhabitants). Other major towns include Beshkent, Chirakchi (Chiroqchi), Guzar (G‘uzor), Kitab, Koson, Myrishkor, Muborak, Kamashi (Qamashi), Shahrisabz, Shurbazar, and Yakkabog. Qashqadaryo Region is currently (As of 2009) divided into thirteen administrative districts. The region has a well-developed transport infrastructure, with over 350 km of railways and 4000 km of surfaced roads. The city of Shahrisabz, the birthplace of Amir Temur, is the main tourist attraction in the region. Wikimedia Commons has media related to Qashqadaryo Region.